The mbuf (short for memory buffer) is a common concept in networking stacks. The mbuf is used to hold packet data as it traverses the stack. The mbuf also generally stores header information or other networking stack information that is carried around with the packet. The mbuf and its associated library of functions were developed to make common networking stack operations (like stripping and adding protocol headers) efficient and as copy-free as possible. In its simplest form, an mbuf is a memory block with some space reserved for internal information and a pointer which is used to “chain” memory blocks together in order to create a “packet”. This is a very important aspect of the mbuf: the ability to chain mbufs together to create larger “packets” (chains of mbufs). The main reason is to conserve memory. Consider a networking protocol that generally sends small packets but occasionally sends large ones. The Bluetooth Low Energy (BLE) protocol is one such example. A flat buffer would need to be sized so that the maximum packet size could be contained by the buffer. With the mbuf, a number of mbufs can be chained together so that the occasional large packet can be handled while leaving more packet buffers available to the networking stack for smaller packets. Not all mbufs are created equal. The first mbuf in a chain of mbufs is a special mbuf called a “packet header mbuf”. The reason that this mbuf is special is that it contains the length of all the data contained by the chain of mbufs (the packet length, in other words). 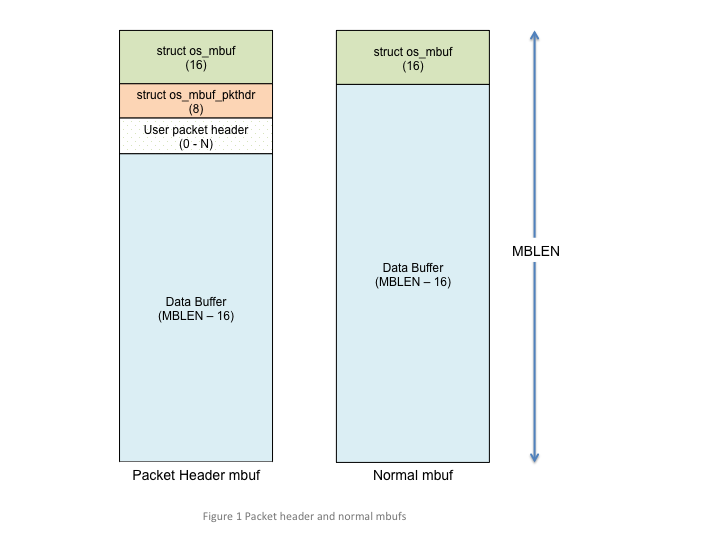 The packet header mbuf may also contain a user defined structure (called a “user header”) so that networking protocol specific information can be conveyed to various layers of the networking stack. Any mbufs that are part of the packet (i.e. in the mbuf chain but not the first one) are “normal” (i.e. non-packet header) mbufs. 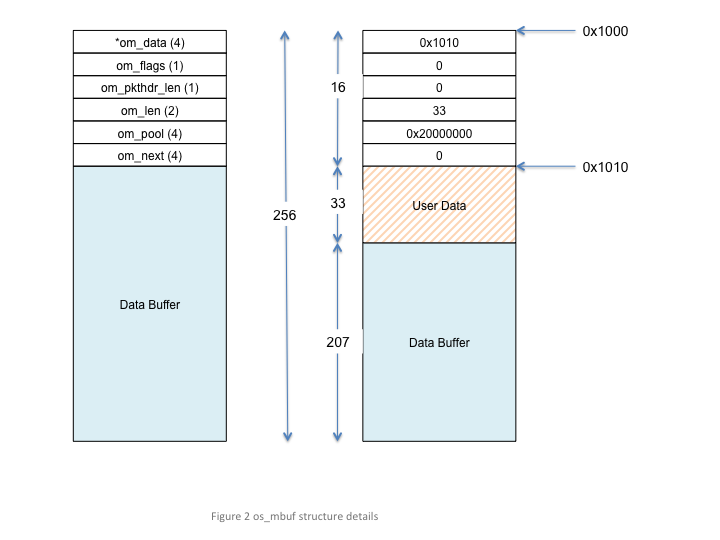 A normal mbuf does not have any packet header or user packet header structures in them; they only contain the basic mbuf header (struct os_mbuf). Figure 1 illustrates these two types of mbufs. Note that the numbers/text in parentheses denote the size of the structures/elements (in bytes) and that MBLEN is the memory block length of the memory pool used by the mbuf pool. Now let’s take a deeper dive into the mbuf structure. Figure 2 illustrates a normal mbuf and breaks out the various fields in the c:type: os_mbuf structure. The om_data field is a pointer to where the data starts inside the data buffer. Typically, mbufs that are allocated from the mbuf pool (discussed later) have their om_data pointer set to the start of the data buffer but there are cases where this may not be desirable (added a protocol header to a packet, for example). The om_flags field is a set of flags used internally by the mbuf library. Currently, no flags have been defined. The om_pkthdr_len field is the total length of all packet headers in the mbuf. For normal mbufs this is set to 0 as there is no packet or user packet headers. For packet header mbufs, this would be set to the length of the packet header structure (16) plus the size of the user packet header (if any). Note that it is this field which differentiates packet header mbufs from normal mbufs (i.e. if om_pkthdr_len is zero, this is a normal mbuf; otherwise it is a packet header mbuf). The om_len field contains the amount of user data in the data buffer. When initially allocated, this field is 0 as there is no user data in the mbuf. The omp_pool field is a pointer to the pool from which this mbuf has been allocated. This is used internally by the mbuf library. The omp_next field is a linked list element which is used to chain mbufs. Figure 2 also shows a normal mbuf with actual values in the os_mbuf structure. This mbuf starts at address 0x1000 and is 256 bytes in total length. In this example, the user has copied 33 bytes into the data buffer starting at address 0x1010 (this is where om_data points). Note that the packet header length in this mbuf is 0 as it is not a packet header mbuf. Figure 3 illustrates the packet header mbuf along with some chained mbufs (i.e a “packet”). In this example, the user header structure is defined to be 8 bytes. Note that in figure 3 we show a number of different mbufs with varying om_data pointers and lengths since we want to show various examples of valid mbufs. For all the mbufs (both packet header and normal ones) the total length of the memory block is 128 bytes. Mbufs are collected into “mbuf pools” much like memory blocks. The mbuf pool itself contains a pointer to a memory pool. The memory blocks in this memory pool are the actual mbufs; both normal and packet header mbufs. Thus, the memory block (and corresponding memory pool) must be sized correctly. In other words, the memory blocks which make up the memory pool used by the mbuf pool must be at least: sizeof(struct os_mbuf) + sizeof(struct os_mbuf_pkthdr) + sizeof(struct user_defined_header) + desired minimum data buffer length. For example, if the developer wants mbufs to contain at least 64 bytes of user data and they have a user header of 12 bytes, the size of the memory block would be (at least): 64 + 12 + 16 + 8, or 100 bytes. Yes, this is a fair amount of overhead. However, the flexibility provided by the mbuf library usually outweighs overhead concerns. Creating an mbuf pool is fairly simple: create a memory pool and then create the mbuf pool using that memory pool. Once the developer has determined the size of the user data needed per mbuf (this is based on the application/networking stack and is outside the scope of this discussion) and the size of the user header (if any), the memory blocks can be sized. In the example shown below, the application requires 64 bytes of user data per mbuf and also allocates a user header (called struct user_hdr). Note that we do not show the user header data structure as there really is no need; all we need to do is to account for it when creating the memory pool. In the example, we use the macro MBUF_PKTHDR_OVERHEAD to denote the amount of packet header overhead per mbuf and MBUF_MEMBLOCK_OVERHEAD to denote the total amount of overhead required per memory block. The macro MBUF_BUF_SIZE is used to denote the amount of payload that the application requires (aligned on a 32-bit boundary in this case). All this leads to the total memory block size required, denoted by the macro MBUF_MEMBLOCK_OVERHEAD. Msys stands for “system mbufs” and is a set of API built on top of the mbuf code. The basic idea behind msys is the following. The developer can create different size mbuf pools and register them with msys. The application then allocates mbufs using the msys API (as opposed to the mbuf API). The msys code will choose the mbuf pool with the smallest mbufs that can accommodate the requested size. Let us walk through an example where the user registers three mbuf pools with msys: one with 32 byte mbufs, one with 256 and one with 2048. If the user requests an mbuf with 10 bytes, the 32-byte mbuf pool is used. If the request is for 33 bytes the 256 byte mbuf pool is used. If an mbuf data size is requested that is larger than any of the pools (say, 4000 bytes) the largest pool is used. While this behaviour may not be optimal in all cases that is the currently implemented behaviour. All this means is that the user is not guaranteed that a single mbuf can hold the requested data. The msys code will not allocate an mbuf from a larger pool if the chosen mbuf pool is empty. Similarly, the msys code will not chain together a number of smaller mbufs to accommodate the requested size. While this behaviour may change in future implementations the current code will simply return NULL. Using the above example, say the user requests 250 bytes. The msys code chooses the appropriate pool (i.e. the 256 byte mbuf pool) and attempts to allocate an mbuf from that pool. If that pool is empty, NULL is returned even though the 32 and 2048 byte pools are not empty. Note that no added descriptions on how to use the msys API are presented here (other than in the API descriptions themselves) as the msys API is used in exactly the same manner as the mbuf API. The only difference is that mbuf pools are added to msys by calling os_msys_register(). The following examples illustrate typical mbuf usage. There are two basic mbuf allocation API: c:func: os_mbuf_get() and os_mbuf_get_pkthdr(). The first API obtains a normal mbuf whereas the latter obtains a packet header mbuf. Typically, application developers use os_mbuf_get_pkthdr() and rarely, if ever, need to call os_mbuf_get() as the rest of the mbuf API (e.g. os_mbuf_append(), os_mbuf_copyinto(), etc.) typically deal with allocating and chaining mbufs. It is recommended to use the provided API to copy data into/out of mbuf chains and/or manipulate mbufs. In example1, the developer creates a packet and then sends the packet to a networking interface. The code sample also provides an example of copying data out of an mbuf as well as use of the “pullup” api (another very common mbuf api). * and chained together to accommodate the total packet length. In example2 we show use of the pullup api as this illustrates some of the typical pitfalls developers encounter when using mbufs. The first pitfall is one of alignment/padding. Depending on the processor and/or compiler, the sizeof() a structure may vary. Thus, the size of my_protocol_header may be different inside the packet data of the mbuf than the size of the structure on the stack or as a global variable, for instance. 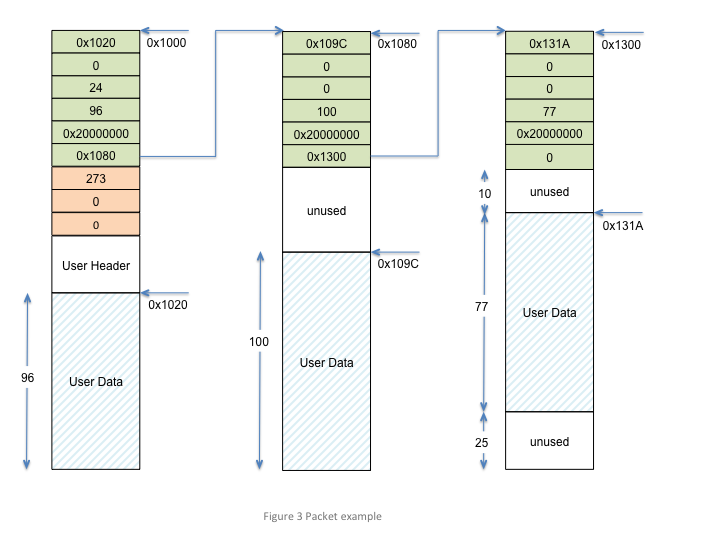 While some networking protcols may align protocol information on convenient processor boundaries many others try to conserve bytes “on the air” (i.e inside the packet data). Typical methods used to deal with this are “packing” the structure (i.e. force compiler to not pad) or creating protocol headers that do not require padding. example2 assumes that one of these methods was used when defining the my_protocol_header structure. Another common pitfall occurs around endianness. A network protocol may be little endian or big endian; it all depends on the protocol specification. Processors also have an endianness; this means that the developer has to be careful that the processor endianness and the protocol endianness are handled correctly. In example2, some common networking functions are used: ntohs() and ntohl(). These are shorthand for “network order to host order, short” and “network order to host order, long”. Basically, these functions convert data of a certain size (i.e. 16 bits, 32 bits, etc) to the endianness of the host. Network byte order is big-endian (most significant byte first), so these functions convert big-endian byte order to host order (thus, the implementation of these functions is host dependent). Note that the BLE networking stack “on the air” format is least signigicant byte first (i.e. little endian), so a “bletoh” function would have to take little endian format and convert to host format. A long story short: the developer must take care when copying structure data to/from mbufs and flat buffers! A final note: these examples assume the same mbuf struture and definitions used in the first example. * length, and have had some time in flight. The mqueue construct allows a task to wake up when it receives data. Typically, this data is in the form of packets received over a network. A common networking stack operation is to put a packet on a queue and post an event to the task monitoring that queue. When the task handles the event, it processes each packet on the packet queue. Not shown in the code example is a call my_task_rx_data_func. Presumably, some other code will call this API. * Removes each packet from the receive queue and processes it. * Called when a packet is received. * process, sleep until one arrives. An mqueue is a queue of mbufs that ties to a particular task’s event queue. Mqueues form a helper API around a common paradigm: wait on an event queue until at least one packet is available, then process a queue of packets. When mbufs are available on the queue, an event OS_EVENT_T_MQUEUE_DATA will be posted to the task’s mbuf queue. 0 on success, non-zero on failure. ev_cb: The callback to associate with the mqeueue event. Typically, this callback pulls each packet off the mqueue and processes them. arg: The argument to associate with the mqueue event. Remove and return a single mbuf from the mbuf queue. The next mbuf in the queue, or NULL if queue has no mbufs. mq: The mbuf queue to pull an element off of. packet header mbuf) to an mqueue. The event associated with the mqueue gets posted to the specified eventq. mq: The mbuf queue to append the mbuf to. evq: The event queue to post an event to. m: The mbuf to append to the mbuf queue. MSYS is a system level mbuf registry. Allows the system to share packet buffers amongst the various networking stacks that can be running simultaeneously. Mbuf pools are created in the system initialization code, and then when a mbuf is allocated out of msys, it will try and find the best fit based upon estimated mbuf size. os_msys_register() registers a mbuf pool with MSYS, and allows MSYS to allocate mbufs out of it. Allocate a mbuf from msys. Based upon the data size requested, os_msys_get() will choose the mbuf pool that has the best fit. A freshly allocated mbuf on success, NULL on failure. De-registers all mbuf pools from msys. Allocate a packet header structure from the MSYS pool. See os_msys_register() for a description of MSYS. Count the number of blocks in all the mbuf pools that are allocated. Return the number of free blocks in Msys. Initialize a pool of mbufs. 0 on success, error code on failure. buf_len: The length of the buffer itself. Get an mbuf from the mbuf pool. The mbuf is allocated, and initialized prior to being returned. An initialized mbuf on success, and NULL on failure. leadingspace: The amount of leadingspace to put before the data section by default. Allocate a new packet header mbuf out of the os_mbuf_pool. user_pkthdr_len: The packet header length to reserve for the caller. Duplicate a chain of mbufs. Return the start of the duplicated chain. Locates the specified absolute offset within an mbuf chain. The offset can be one past than the total length of the chain, but no greater. The mbuf containing the specified offset on success. NULL if the specified offset is out of bounds. om: The start of the mbuf chain to seek within. off: The absolute address to find. out_off: On success, this points to the relative offset within the returned mbuf. Calculates the length of an mbuf chain. Calculates the length of an mbuf chain. If the mbuf contains a packet header, you should use OS_MBUF_PKTLEN() as a more efficient alternative to this function. The length, in bytes, of the provided mbuf chain. om: The mbuf to measure. Append data onto a mbuf. Reads data from one mbuf and appends it to another. On error, the specified data range may be partially appended. Neither mbuf is required to contain an mbuf packet header. 0 on success; OS_EINVAL if the specified range extends beyond the end of the source mbuf chain. dst: The mbuf to append to. src: The mbuf to copy data from. src_off: The absolute offset within the source mbuf chain to read from. len: The number of bytes to append. Release a mbuf back to the pool. Free a chain of mbufs. Adjust the length of a mbuf, trimming either from the head or the tail of the mbuf. req_len: The length to trim from the mbuf. If positive, trims from the head of the mbuf, if negative, trims from the tail of the mbuf. Performs a memory compare of the specified region of an mbuf chain against a flat buffer. 0 if both memory regions are identical; A memcmp return code if there is a mismatch; INT_MAX if the mbuf is too short. om: The start of the mbuf chain to compare. off: The offset within the mbuf chain to start the comparison. data: The flat buffer to compare. len: The length of the flat buffer. Compares the contents of two mbuf chains. The ranges of the two chains to be compared are specified via the two offset parameters and the len parameter. Neither mbuf chain is required to contain a packet header. 0 if both mbuf segments are identical; A memcmp() return code if the segment contents differ; INT_MAX if a specified range extends beyond the end of its corresponding mbuf chain. om1: The first mbuf chain to compare. offset1: The absolute offset within om1 at which to start the comparison. om2: The second mbuf chain to compare. offset2: The absolute offset within om2 at which to start the comparison. len: The number of bytes to compare. Increases the length of an mbuf chain by adding data to the front. If there is insufficient room in the leading mbuf, additional mbufs are allocated and prepended as necessary. If this function fails to allocate an mbuf, the entire chain is freed. The specified mbuf chain does not need to contain a packet header. The new head of the chain on success; NULL on failure. omp: The mbuf pool to allocate from. om: The head of the mbuf chain. len: The number of bytes to prepend. Prepends a chunk of empty data to the specified mbuf chain and ensures the chunk is contiguous. If either operation fails, the specified mbuf chain is freed and NULL is returned. The modified mbuf on success; NULL on failure (and the mbuf chain is freed). om: The mbuf chain to prepend to. len: The number of bytes to prepend and pullup. Copies the contents of a flat buffer into an mbuf chain, starting at the specified destination offset. If the mbuf is too small for the source data, it is extended as necessary. If the destination mbuf contains a packet header, the header length is updated. om: The mbuf chain to copy into. off: The offset within the chain to copy to. src: The source buffer to copy from. len: The number of bytes to copy. Attaches a second mbuf chain onto the end of the first. If the first chain contains a packet header, the header’s length is updated. If the second chain has a packet header, its header is cleared. first: The mbuf chain being attached to. second: The mbuf chain that gets attached. Increases the length of an mbuf chain by the specified amount. If there is not sufficient room in the last buffer, a new buffer is allocated and appended to the chain. It is an error to request more data than can fit in a single buffer. A pointer to the new data on success; NULL on failure. om: The head of the chain to extend. len: The number of bytes to extend by. Rearrange a mbuf chain so that len bytes are contiguous, and in the data area of an mbuf (so that OS_MBUF_DATA() will work on a structure of size len.) Returns the resulting mbuf chain on success, free’s it and returns NULL on failure. If there is room, it will add up to “max_protohdr - len” extra bytes to the contiguous region, in an attempt to avoid being called next time. The contiguous mbuf chain on success, NULL on failure. Removes and frees empty mbufs from the front of a chain. If the chain contains a packet header, it is preserved. The head of the trimmed mbuf chain. om: The mbuf chain to trim. Increases the length of an mbuf chain by inserting a gap at the specified offset. The contents of the gap are indeterminate. If the mbuf chain contains a packet header, its total length is increased accordingly. This function never frees the provided mbuf chain. 0 on success; SYS_[…] error code on failure. om: The mbuf chain to widen. off: The offset at which to insert the gap. len: The size of the gap to insert. Get a packet header pointer given an mbuf pointer. Given a mbuf packet header pointer, return a pointer to the mbuf. Gets the length of an entire mbuf chain. The specified mbuf must have a packet header. Access the data of a mbuf, and cast it to type. Access the “user header” in the head of an mbuf chain. om: Pointer to the head of an mbuf chain. Retrieves the length of the user header in an mbuf. om: Pointer to the mbuf to query. Returns the leading space (space at the beginning) of the mbuf. Works on both packet header, and regular mbufs, as it accounts for the additional space allocated to the packet header. Returns the trailing space (space at the end) of the mbuf. Works on both packet header and regular mbufs. A mbuf pool from which to allocate mbufs. Total length of the databuf in each mbuf. The memory pool which to allocate mbufs out of. A packet header structure that preceeds the mbuf packet headers. Overall length of the packet. Current pointer to data in the structure. Flags associated with this buffer, see OS_MBUF_F_* defintions. Length of data in this buffer. The mbuf pool this mbuf was allocated out of. Pointer to the beginning of the data, after this buffer. Structure representing a queue of mbufs. Event to post when new buffers are available on the queue.